How to get from the airport to Amsterdam? In Amsterdam in summer, there is no delight greater than having a drink, lunch or dinner while with a view on the water. Especially on warm, sunny days, the water has a refreshing and calming effect. You can watch the many boats go by while sipping on a cocktail or munch on some traditional Dutch bitterballs. The days last long in The Netherlands, so you can spend long evenings along a waterside terrace in Amsterdam, soaking in the last of rays and watching the sunset. Many bars and restaurants offer views on the canals, but it’s not that easy to find a space on a terrace that sits along the canal. Here are 10 of the best. De Waterkant means The Waterside in Dutch and this is the perfect name for this bar, as it lies peacefully along the broad Singelgracht Canal. The bar has a huge outside terrace and when it is too busy, you can always sit on the ground and dangle your feet from the dock. De Waterkant looks out onto the south-westside, so this is one to catch the last rays. The bar is inspired by Surinam, a former Dutch colony in South-America, so there’s lots of good Surinam-inspired small bites to eat and they even have Parbo, the local beer from Surinam. From the roadside, (it is on Marnixstraat, not far from Leidseplein), it’s rather difficult to spot this canalside bar, but you can just follow the huge Q-Park indoor parking. Café De Jaren (‘The Years’) is well known among the locals. De Jaren is a beautiful, bright and airy grand-cafe bar with an intellectual style (lots of magazines and newspapers to read!! ), right in the center of the city. In the back, there are 2 spacious, quiet terraces. One sits on the 2nd floor, so there is always a spot available, even for larger groups. De Jaren is an easy café to miss when you are a tourist, because the terraces are located on the back side and cannot be seen from the entrance. But it’s well worth checking it out. It has a great, quiet terrace with decent food and good service. Like Café De Jaren, Spanjer & Van Twist has been around for, what feels like, ages. The restaurant is very decent and friendly prices, but the best is sitting outside on their terrace. The terrace is located a little below street level along a small canal. There used to be a sluice located here to cleanse the water of the canal by creating a flow of water. This gives you the chance to be really close to the water. Spanje & Van Twist is located near the Anne Frank Museum. Great view on the water from Mandelhuisje, inn and hangout. Along the IJ on the North Side are a bunch of great terraces, all along the waterside. The Mandelahuisje is quite new and a real hidden gem. It is actually an inn and has a beautiful terrace along the IJ. You can spend hours in their cosy beach chairs, watching ferries, cargo ships and cruise boats going by while you sip on their biological Spanish house wine, munch on some soup, cake, pizza or simpele dish. Open from 10 till 22.00. The Mandelahuisje is located between the landing spots of the ferries (see map). An easy 8-minute walk from the free ferry and worth it! angout, food at all times of the day and a fun activities like open air cinema nights. For a young crowd. 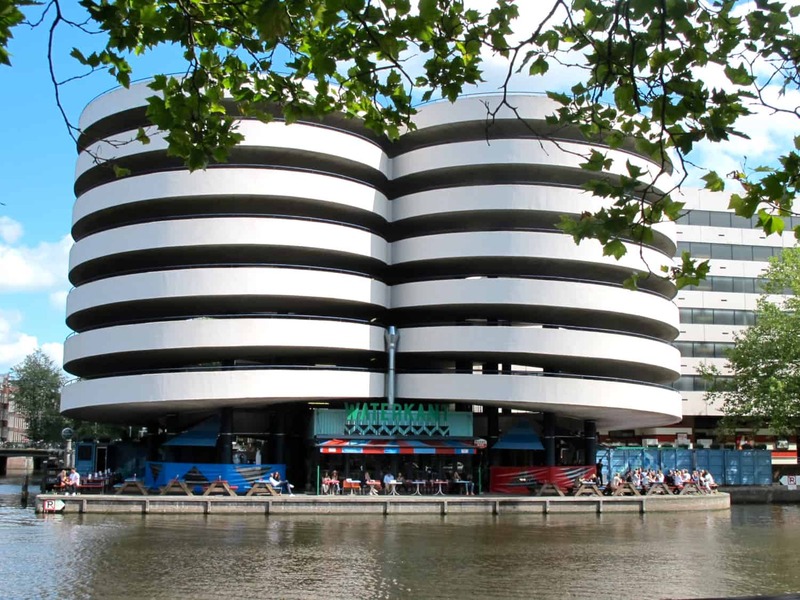 Amstelhaven’s neighbour is the Amstel Hotel (go down the stairs), so clientele can be a bit on the pretentious side. The terrace of Amstelhaven is on wooden docks. You have a boat? You can moor it here. Small menu. Amstelhaven, next door to Amstel Hotel, Amsterdam. Brown bar Café Hesp has a large outside terrace on the Amstel river. Hesp is probably one of the best options is you want a view on the river Amstel. Hesp is a classic Dutch brown bar. The terrace is large, the beers are cold 30 variaties on tap, o er 40 bottled, but if you come around after work-drinks time, you might not get a seat. Order your choice of beer with a plate of bitterballs and watch the sunset on the Amstel river. Pub style food. Also on the Amstel, but a bit further down the river, is the classy Riva. The bar/restaurant is located on a boat and the terrace is very good. Riva is around the corner from the Amstel railway station. Riva is quite chique, so expect men who are not afraid to order a bottle of champagne for their sunglassed woman. Stylish Riva along the Amstel river. The Westergasfabriek is a large area with many great bars and outside dining options, but the Westergasterras gets a special mention because you can beanbag your drinks along the water. It’s a bit swampy, but still, it is water and very relaxing! Edel is located in the west side of Amsterdam, at the end of the Kinkerstraat. The building is interesting, made in the Amsterdam School style architecture, it used be a school for the art of jewelry making. Especially on Friday for after work drinks, this bar is hugely popular with a young crowd. Their terrace is huge and hugs two canals. How to do Amsterdam cheap? Hi! Welcome to What’s up with Amsterdam! WHICH PASS SHOULD YOU GET? Copyright © 2018 - What's up with Amsterdam - All Rights Reserved.